Compare discounts for Hotels Motels in Santa Fe, New Mexico! Founded in 1607, Santa Fe is the second oldest city in the United States and is considered both the highest and oldest capital city in America. Santa Fe is located at an elevation of 7,000 feet above sea level at the base of the southern Rocky Mountains. Santa Fe enjoys over 330 days of sunshine per year, offering spectacular views of New Mexico romantic and colorful sunsets. The sunny skies attract almost 1.5 million visitors annually to Santa Fe. Santa Fe is the third largest art market with 250 art galleries and dealers in town. Note: Lists are not identical. 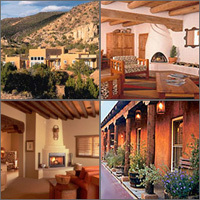 Different sites offer different accommodation options for Santa Fe. Eldorado Hotel flourishes 219 graciously appointed guest rooms and suites, decorated in the distinguished 'Santa Fe Style', many of which feature Kiva fireplaces and terraces, or balconies overlooking the majestic Sangre de Cristo Mountains. All 35 unique rooms and suites have fireplaces, butler service and are decorated with authentic Native American art and handcrafted furnishings. Situated on a six-acre, private estate in downtown Santa Fe, La Posada de Santa Fe is a luxury resort and spa with 159 adobe-style rooms. Renovated and re-opened in 1999, Old World Southwestern charm and New World luxuries bestow an atmosphere of elegance and comfort on this historic retreat. The Inn of the Governors is located in the heart of downtown Santa Fe within the historic plaza. Ideally located near the historic downtown plaza, the Hilton Santa Fe is a unique blend of old and new offering luxurious accommodations in the grand Southwestern style. The Hotel Loretto is the most photographed building in New Mexico and embraces the legendary Loretto Chapel, famous for its circular staircase of two complete 360-degree turns that stands with only center support. Las Palomas offers the best of Old world Santa Fe living. As Santa Fe's only Native American-owned hotel, Hotel Santa Fe provides more than just incomparable accommodations and a super location. Step into Santa Fe's past inside and out at this century old inn and one of the last private homes on a historic street a block away from the center of the city. The Hotel Plaza Real is a picturesque boutique hotel offering 56 deluxe suites and guest rooms - most featuring wood burning fireplaces, handcrafted furnishings and art. The Hotel St. Francis traces its history to the Palace Hotel, known as the De Vargas for its last dozen years. This hotel was built in the 1880's. In January 1922, in what was the biggest fire in Santa Fe in 300 years, the De Vargas burned completely to the ground leaving only the brick chimney to mark the location. Sunrise Springs is an oasis, an exquisite 69-acre and 32 room inn and retreat nestled in. The Camas De Santa Fe is located in downtown Santa Fe, two blocks from the Plaza, three blocks from Palace of the Governors and 15 miles from the Santa Fe Ski Basin. Whether you're traveling on business, planning a meeting or enjoying the famed art centers and attractions, the Santa Fe Courtyard by Marriott offers a perfect southwestern oasis. All La Quinta inns have a fresh, new look with crisp white exteriors and teal trim, softly colored lobbies and lush landscaping.